Woollarawarre Bennelong was born around 1764 in Wangal country on the southern side of the Parramatta River. The Wangal occupied the meandering mangrove-lined estuary stretching from Parramatta to Darling Harbour which supported an abundance of animal and birdlife, fish and oysters. Bennelong often assured me, that the island Me-mel (called by us Goat Island) close by Sydney Cove was his property; that it was his father’s … He told us of other people who possessed this hereditary property, which they retained undisturbed. In general the canoe is assigned to her, into which she puts the ﬁre, and pushes off into deep water, to ﬁsh with hook and line, this being the province of the women. If she have [sic] a child at the breast, she takes it with her. And thus in her skiff, a piece of bark tied at both ends with vines, and the edge of it just above the water, she pushes out regardless of the elements, if they be but commonly agitated. The tribe of the Cadi inhabit the south side [of Port Jackson] extending from the south head to Long Cove [Darling Harbour]; at which place the district of Wanne, and the tribe Wangal, commences, extending as far as Par-ra-mata or Rose Hill. Dexterity in throwing, and parrying the spear, is considered as the highest acquirement: the children of both sexes practice from the time that they are able to throw a rush … It forms their constant recreation. They afterwards heave at each other with pointed twigs. He who acts on the defensive, holds a piece of new soft bark in the left hand, to represent a shield, in which he receives the darts of the assailant, the points sticking in it. The chief; pleasing figure but somewhat thin. ... of good statue, and stoutly made, with a bold intrepid countenance, which bespoke defiance and revenge. Although he is known by the name Bennelong, custom dictated that under certain circumstances a range of names could be used. Bennelong had five names that were recorded by the members of the First Fleet. A vocabulary kept by Governor Arthur Phillip and his aides gave them as ‘Wo-lar-re-barre, Wog-ul-trowe, Bannel-lon, Boinba, Bunde-bunda’, Philip Gidley King as ‘Bannelon, Wollewarre,Boinba, Bunde-bunda, Wogletrowey’ and David Collins as ‘Ben-nil-long, Wolar-ra-bar-ray, Wo-gul-trow-e, Boinba, and Bun-de-bun-da’. Watkin Tench indicated that for a time Bennelong chose to be called Wo-lar-a-wàr-ee but the reason for selection of this particular name, and the circumstances under which it was used were not made clear. The earliest physical descriptions of Bennelong were not unflattering. At the age of 25 or 26 years old he was described by Tench as ‘of good stature, and stoutly made, with a bold intrepid countenance, which bespoke defiance and revenge’ and by Captain John Hunter as ‘this Man was a very good looking Young fellow, of a pleasant lively disposition.’ Bennelong was consistently described as being above the average height of his people. He was also apt to demonstrate his strength and skill with the throwing spear. The French scientist François Péron, who tested Bennelong’s strength in 1802 estimated his age as 35 to 36 and noted: ‘The chief; pleasing figure but somewhat thin. The distribution and organisation of families, extended kin groups and clans that occupied the Sydney region before 1788 is far from well-understood. The interpretation of information gleaned from the people inhabiting the areas immediately adjacent to Sydney Cove is sometimes confusing, contradictory or possibly deliberately obscure. There were many aspects of law and ritual that could not be transmitted to people other than initiates, and it is therefore likely that aspects of the social organisation of the Port Jackson/Parramatta River groups could not be willingly communicated to outsiders. Some information regarding the occupants of particular areas was also coloured by the relationship that the informant had with those groups. The names of places and the manner in which people occupying those places identified themselves, is not as clearly defined as has been presented in the past. Many of the early renderings and interpretation of indigenous words as well as the idiosyncratic spelling of the eighteenth century have added to the confusion. Bennelong – although described above as Wangal, was part of a network of clans that occupied the drainage basin of the Parramatta River and Port Jackson. These clans have been described collectively as Eora – a word used by the people themselves having the meaning of ‘men’ or ‘people’. Collins also indicated that the people of Port Jackson had kinship with the peoples of Broken Bay and Botany Bay. The Eora territory was divided into a number of regions each of which contained named localities. The names of the regions that existed when the eora were in undisturbed occupation of Port Jackson and the Parramatta River were recorded as Cadi (South Head to Darling Harbour), Wan (Darling Harbour to Parramatta), Burramatta (Parramatta), Wallumeda (Parramatta to the Lane Cove River) and Camerai (Gamara) (Lane Cove River to North Head. The precise boundaries between these regions remains unclear but common practice indicates that ridge lines forming watersheds to major streams and rivers were the usual manner of separating territories. The extent of each region inland from the river and harbor was likely to be delineated by the ridgelines and drainage basins of the Hawkesbury-Nepean system in the west, Broken Bay in the north, and Botany Bay and the George’s River in the south. Men from each region were identified by the addition of the suffix -gal, while women were identified with the addition of the suffix –galiang. Each region may have contained 200 to 300 people consisting of related family groups each of which may have numbered 20 to 60 men, women and children. Each group may also have identified themselves by a separate name associated with the specific location over which they had control. An example of this is the Darramurragal/Tarra-merragal a ‘tribe’ described in William Dawe’s vocabulary as located within the district of Wanne (Wan). At the time of European settlement in 1788 the people inhabiting the Port Jackson region may have numbered approximately 1500 individuals – an estimate made by Governor Phillip. This number has not been seriously questioned. In the documentation of the eighteenth and nineteenth centuries each group with the –gal suffix was generally described as a ‘tribe’, this being the closest collective noun for a group of families that had associations with a particular location. Each group within the Eora land was linked by extended kinship, common language, traditions, ritual, economy and trade networks that also extended beyond the lands. For Eora the Parramatta River and Port Jackson formed the geographical backbone of their world and was their primary source of food and the principal means of communication between each group. The bark canoe or nawi provided both a platform for fishing and a means of travelling up and down Port Jackson and the Parramatta River and their branches. Diet relied heavily on what the sea, estuaries and rivers could provide such as fish and shellfish. At the time of the arrival of the First Fleet in 1788 the first foreign observers of the considered that the Gamaragal held a pre-eminent position within the Port Jackson communities. Whether this was a reality recognised by the people themselves, it certainly determined the manner in which the British would deal with the indigenous population of Port Jackson..
Bennelong was born in c.1764 as a member of the clan that occupied Wan (or Wanne) as their home territory. This was the area on the southern side of the Parramatta River between the present Darling Harbour and Parramatta. As a man of Wan Bennelong was referred to as a Wangal. He may have also identified himself with a particular locality within Wan but this reference has not come down to us. Wan was an extensive territory that faced the saltwater estuary of the Parramatta river. The region contained rocky foreshores, mangrove flats, salt-marshes and small beaches. The hinterland consisted of low hills and flatlands crossed by a number of freshwater streams. Bennelong never revealed the precise location of his birthplace. It has been suggested that he may have come from The Flats around Homebush Bay. According to Bennelong his immediate family also had a particular connection with Me-mel (Goat Island). 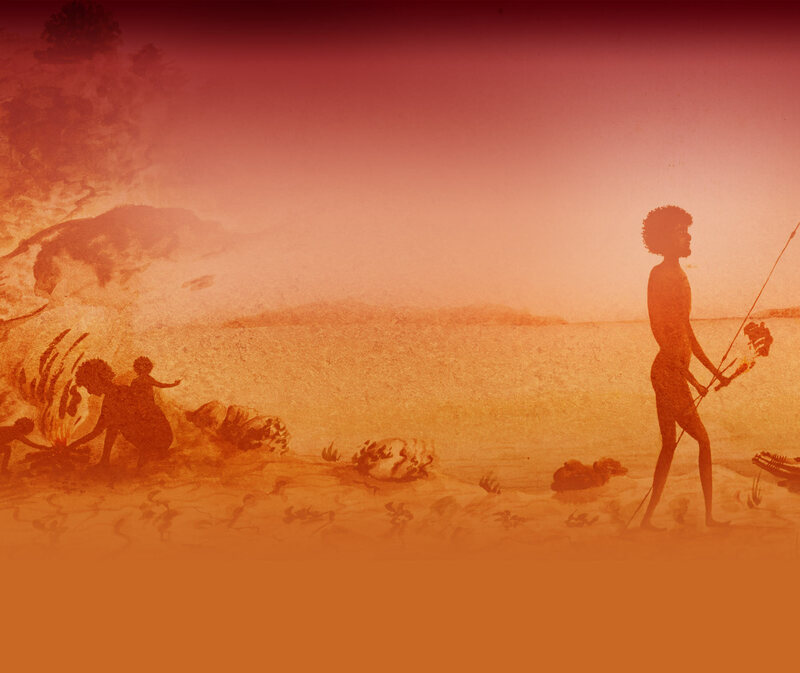 Bennelong’s family and connections prior to the arrival of Europeans are not well known. A single reference to his parentage was made by the Sydney Gazette in 1817. The article was submitted by a correspondent, who signed as Atticus, names Bennelong’s father as Goorah-goorah, his mother as Ga-gulh, and his step-mother as Yahanua. The article is a facetious comparison between Bennelong and the Greek hero Theseus. The author of this piece takes liberties with the facts in order to make the comparison. It is unclear if the author had access to information regarding Bennelong’s parentage or simply invented suitably exotic names to suit the purpose of the article. That Atticus was privy to information not recorded by those who knew Bennelong seems unlikely, particularly when Atticus is in error in a number of very basic (and known) aspects of Bennelong’s life. Information regarding Bennelong’s siblings is a little more certain. Bennelong had four sisters and through their marriages he brokered alliances among his own people. This maintained a web of kinship ties and relationships that extended his influence and ensured his position as a leader. In his second language notebook (1791), Lieutenant William Dawes listed the names of Bennelong’s sisters as Wariwéar, Karangarang, Wúrrgan and Munánguri’. Warreeweer (Wariwéar) married Anganángan or Gnung-a Gnung-a Murremurgan, who adopted the name ‘Collins’ from Phillip’s aide David Collins. While her husband was at sea, Warreeweer lived with an Aboriginal man by the name of Wyatt. Carangarang (Karangarang) first married Yow-war-re or Yuwarry. Carangarang’s second husband is referred to by the Reverend Charles Wilton as ‘Harry alias Corrangie’. Worogan (Wúrrgan) married Yerinibe or Yeranabie Goruey, called ‘Palmer’, a Burramattagal. Of the fourth sister, Munánguri, little is known. Anon c1791, ‘Vocabulary of the language of N.S. Wales in the neighbourhood of Sydney (Native and English, but not alphabetical)’, Notebook C, School of Oriental and African Studies, University of London, MS 41645 (c): 41.13, [‘Governors’ Vocabulary’ – hereafter GV c1791]: 57.8; King in Hunter 1793: 405; Collins 1975[1798–1802] I: engravings vii. Although I call him only Bannelon, he had besides several appellations; and for a while he chose to be distinguished by that of Wo-lar-a-wàr-ee. (Tench 1793 : 36). Bennelong exchanged this name with the Governor as a mark of respect (Tench 1793: 36). Dawes used the word in order to differentiate between indigenous people and his own people. To this end the word ‘whiteman’ (or whitemána) was introduced (by Dawes?) into the Indigenous lexicon in preference to the locative form that would have been something like Berıwȧlgal (Be_re_wal_gal = the name given to us by the natives, Berewal = a great distance off (Dawes Book C page 9)). Interestingly, in an age when the initial upper-case letter was over-employed, Dawes uses lower-case when the word eora appears in context. Attenbrow provides a history of the appearance of the word in later nineteenth century and early twentieth century texts. W. Wentworth-Bucknell and George Thornton use the term in 1899 as a ‘tribal’ name for people inhabiting the Port Jackson/Sydney region in 1788 - these writers do not provide sources. The term as defining a specific tribal/language group gained greater currency with Norman Tindale’s publication Aboriginal Tribes of Australia (1974). In 1987 Kohen and Lampert drew the conclusion that 'the Dharug language had two major dialects, that of the Eora or coastal people and that spoken by people occupying the inland area from Parramatta to the Blue Mountains' (Kohen and Lampert in Mulvaney, Australians to 1788 (1987:345)). The term in this context is used to define language and identifies the users of that language as being Eora. In Jakelin Troy’s The Sydney Language (1993) ‘eora’ is translated as ‘people’ or ‘Aboriginal people’ and indicates that the term was not used to refer to non-Aboriginal people. Powell and Hesline (2010) have taken issue with the very existence of the region called Wan suggesting that the name was used only during the initial period and meant where? – this being an example of the informant Bennelong mimicking the question put to him of where do you belong? Given Bennelong’s later punctiliousness when dealing with placenames there was ample opportunity for correction. Each family group, or regional sub-group is often considered to be a ‘clan’. Recent researchers have attempted to relocate the Darramurragal/Tarra-merragal to the Turramurra district on the basis of a similarity in name. Similarly, Pemulwuy, the resistance fighter of the 1790s and 1800s is described as being Bediagal in Dawes’ vocabulary. As part of the same entry he is described as being Tugagal and Tugara. One of the names may have been that used by eora informants as their identifier for Pemulwuy’s group and the other may be how he may have identified himself. Powell and Hesline (2010) have suggested that the Gamaragal were not a group of people attached to a place but members of a hierarchy that had powerful ritual functions independent of kin group. The evidence presented in support of this thesis ignores the place name described by Collins as Cam-mer-ray and confuses place names with similar sounding names. Similarly Powell and Hesline have not considered that officiating at ceremonies in Aboriginal society was reciprocal in nature. The tribe of the Cadi inhabit the south side [of Port Jackson] extending from the south head to Long Cove [Darling Harbour]; at which place the district of Wanne, and the tribe Wangal, commences, extending as far as Par-ra-mata or Rose Hill. (King in Hunter 1793 [1968:412]). Dawes 1791, ‘Vocabulary of the language of N.S. Wales in the neighbourhood of Sydney. Native and English, by Dawes’, SOAS, Marsden Collection, Notebook B, MS 4165 (b) 9.4.